The Confraternity of the Rosary fosters devotion to the Blessed Mother. Members are asked to recite the Mysteries of the Rosary each week. A Mass is offered on the first Sunday of each month for the intentions of the living and deceased members. 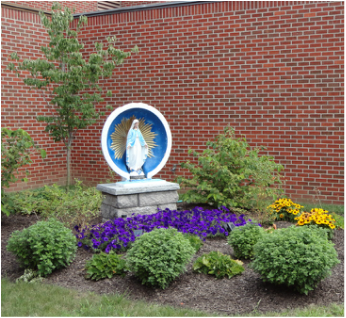 Members are not required to attend meetings or pay dues, but throughout the year, they are afforded opportunities for public recitation of the Rosary and spiritual growth along with the parish at large. The Rosary is recited on the first Saturday of every month from 3:00 p.m. - 4:00 p.m. Annually there is a special Crowning of the Statue of Mary in May. In October, the Feast of the Most Holy Rosary is celebrated with Eucharistic Adoration and recitation of the full 20 decades of the Rosary. Each year a trip is sponsored to the Shrine of Divine Mercy in Stockbridge, Massachusetts in the fall. An evening of prayer devoted to life is held in January at the anniversary of the Roe v. Wade Supreme Court decision. For more information, please call Terry Wellenzohn, at 457-4630.